If the furniture in question is situated in a high traffic area, these three things are of the utmost importance: the fabric should be easy to clean; it should be strong; and it should be sturdy. Particularly with furniture that can be considered a showpiece, you obviously want a quality fabric that is worthy of your investment. With the right kind of fabric, your furniture can have a long, lustrous lifespan. 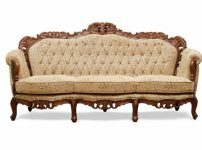 There are a few rules of thumb that most everyone can go by when it comes to upholstered furniture. The first useful tip is to schedule, at least once a year, a professional cleaning. Additionally, don’t wait to protect your fabric. A stain resistant treatment should be applied at the production level. Speaking of protection, shield your upholstered piece from direct sunlight whenever possible. By removing loose fibers and dirt with regular vacuuming, you can avoid pilling. Vacuuming should be done using low suction and with an upholstery attachment. Pilling removers are available at many department stores. To avoid tearing or pulling of the fabric, keep sharp objects and Velcro away from your upholstery. Finally, refer to your fabric care label regarding how to treat spills, which should be tended to immediately to avoid staining. This can’t be stressed enough – at least once a year, have your upholstery professionally cleaned and protect it from sunlight whenever possible. Those two simple things will extend the lifespan of your upholstery significantly. Wrinkling and stretching occur on tight, attached back and seat cushions. Simply tuck excess fabric into the sides to restore their appearance. Fluff down and feather cushions frequently to restore their loft. In the case of removable cushions, fluff, rotate, and flip frequently to increase longevity and avoid wear patterns. Some upholstery tends to have more problems with pilling than others. Frequently, these are fabrics that are made from more than one type of fiber – one week, one strong. Rayon – This synthetic fiber was developed as an imitation cotton, linen, and silk, and it tends to wrinkle. However, high-quality rayon is practical and durable. Polyester – Another synthetic fiber whose fading, crushing, and wrinkling is reduced by combining it with other fabrics. Pilling problems are increased, however, if combined with polyester or wool. Nylon – Our last synthetic fiber is, again, seldom used all by itself in upholstery and it does tend to pill or fade. When mixed with other fabrics it is so resilient that it is considered one of the strongest upholstery fabrics, and can also help fight against crushing when blended with velvet. Linen – This natural fiber wrinkles and soils easily and is therefore recommended for adult areas or formal settings. On the other hand, fading and pilling are less of a problem with linen. To avoid shrinking, it must be professionally cleaned and will not stand up to heavy wear for very long. Cotton – This last natural fiber is blended with other fibers to combat its weaknesses: fire, wrinkling, soil. When it comes to pilling, fading, and wear, however, it provides good resistance. Obviously, the whole point is to make whatever upholstery you choose last as long as possible, yet still look good doing it. As you have seen, the fabric you decide on has a lot to do with the life of your upholstered piece. Choose wisely and you can achieve not only the look you’re going for but lasting quality as well.